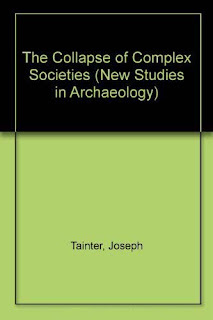 In my last post I started a review of Joseph Tainter's book The Collapse of Complex Societies. I quoted Tainter on how, as marginal returns decline, societies find themselves spending so much on maintaining complexity that they don't have the resources to adequately responding to stress—various sorts of emergencies and disasters. I should have mentioned that this can also be looked at in terms of optimization and resilience. In order to minimize those decreasing marginal returns, complex systems are usually optimized as much as possible. That is to say, they are made as efficient as possible in terms of their intended output under ideal conditions. Unfortunately, this inevitable reduces their adaptability and resiliency. Such systems are very brittle and when even fairly minor things go wrong they tend to break (collapse) where a more resilient system would have been able to adapt and carry on. He also makes it clear (to me, anyway) that adding complexity is our preferred strategy. Even when we reach the point where we are working as hard as we can to just maintain the status quo, we are very reluctant to simplify things. This would seem to imply that our path of progress from the caves to the stars is fated to be interrupted on occasion by collapse, and perhaps stopped altogether. Of course, these ideas are very unwelcome to those of us who have been raised in the religion of progress. We have been taught that progress makes things work better, makes life more convenient and comfortable and holds great hope for the future. But very little is said about what it all costs. It is pretty clear to me that progress amounts to increasing complexity, even if some of that complexity is hidden. My dad's first car, for instance, (a Model T Ford) had a manual choke and manual spark advance and starting it took quite a bit of skill. Today the latest models have push button start which takes care of all those details and works pretty much every time. Much simpler you might say, but have a look under the hood and you'll find that it takes a lot of hidden complexity to achieve this "simplicity". When I first read this book, I was unwilling to even accept the idea of decreasing marginal productivity. Even though Tainter offers extensive examples and statistics in Chapter 4 to show that this is indeed so. Whether it is agriculture, resource production, manufacturing, information processing, sociopolitical control, specialization or overall economic productivity—the law of decreasing returns does indeed apply. Indeed, it is one of the few areas of economics in which we have enough confidence to call a "law". But what I couldn't understand is how you could have decreasing productivity when yields have been going up significantly. Of course, what we are talking about here is decreases in marginal productivity. To use terminology from agriculture, the yields per acre have indeed improved. But the amount of additional (marginal) effort required has grown for each successive improvement. Effort means energy. Traditionally that meant muscle power, human or animal. Today we have achieved great reductions in the amount of muscle power required in agriculture, but only because we have learned to use energy (in the form of fossil fuels) directly to drive machines or manufacture fertilizers and pesticides. With all this, agriculture has become an increasingly complex endeavour which consumes more energy than ever before. And over the last couple of decades yields have started to level off despite heroic measures to improve them. Another illustration of this is the development of the coal-based economy in England, covered by Tainter in chapter 4 of this book. One commonly hears the switchover to coal extolled as a great leap forward, due to the greater BTUs per unit weight to be had from burning coal. Unfortunately, that viewpoint suffers from a certain amount of tunnel vision. The increased costliness per unit of thermal value in the initial shift from wood to coal is apparent, but unfortunately good data on returns to energy investment are not available before the recent period. Modern data not only illustrate the trend quantitatively, but indicates that the process of declining marginal returns is continuing. That was written in 1988. It is interesting to note, from our vantage point in 2017, that coal mining in the UK peaked in 1913 and finally came to an end in 2015. Another aspect of increasing complexity is that, in order to minimize those decreasing marginal returns, complex systems are usually optimized as much as possible. That is to say, they are made as efficient as possible in terms of their intended output. Unfortunately, this inevitable reduces thier adaptability and resiliency. Such systems are very brittle and when even fairly minor things go wrong they tend to break (collapse) where a more resilient system would have been able to adapt and carry on. In each of the cases examined, the costliness of complexity increased over time while the benefits to the population declined. For Rome and Maya, population leveled off or declined before the collapse and the well-being of most people deteriorated. This seems to have come about from the demands of supporting such complex systems. It is not currently known whether something similar happened in the Chacoan case, but it is noteworthy that the number of Outliers participating in this system dropped prior to the final collapse. Quite possibly, Outlier communities, whose participation could not be enforced (unlike the Roman and Mayan cases), withdrew from the network before declining marginal productivity adversely affected their local populations. For the Maya and Chacoans, subsequent abandonment of their territories, and the lack of a substantial reoccupation by agricultural peoples, suggests that there was environmental deterioration during the period of growth. This may indicate that pressures of population on resources had more to do with the Mayan and Chacoan collapses than with that of Rome. The Roman case is very different, for the later Empire was decidedly under populated. In each case, people on the periphery (the northern European barbarians, the northern Maya, and the Western and Eastern Pueblos) rose to prominence after the older society had collapsed. None of these cases can be completely understood by the explanations commonly advanced for them. The fall of Rome was not due to barbarians, for the Empire was economically, organizationally, and militarily stronger than the besiegers. And it was not due to internal weakness, for the Empire remained essentially intact for a period of several hundred years. Rome's collapse was due to the excessive costs imposed on the agricultural population to maintain a far-flung empire in a hostile environment. The fall of the Maya was not due to a peasant revolt, for peasants supported this civilization for over 1000 years. It was not due to invasions, for which there is unclear evidence and uncertain causality, nor to agricultural deterioration, for the evidence of agricultural intensification indicates that the Maya were fully capable of increasing the productivity of their environment. The collapse of the Maya civilization was due to the burdens of an increasingly costly society borne by an increasingly weakened population. Peasant dissatisfaction, foreign pressures, internal conflict, or an agricultural crisis may have provided a final, insurmountable challenge, but such a challenge was effective only because the Maya were following a course that made them vulnerable to collapse. The Chacoan collapse was not due to drought or environmental deterioration, for these were factors which the Chacoans were technically capable of dealing with, and indeed had previously done so. The regional populations of the San Juan Basin chose not to continue participating in the Chacoan network, nor to rise to the challenge of the final drought because the costs of doing so had grown too high in comparison to the advantages conferred. Collapse and migration were economically preferable. This chapter began with the observation that the framework for explaining collapse could probably not be subjected to a formal, quantitative test. 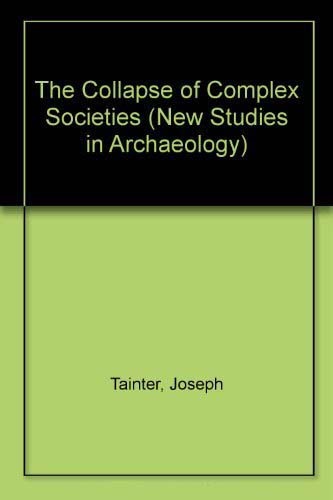 The alternative was to investigate three cases in detail, asking whether the framework developed in Chapter 4 helps us to understand why these societies collapsed. The results lead us to answer the question affirmatively: the collapse of the Western Roman Empire, the Southern Lowland Maya and the Chacoan society can be understood as responses to declining marginal returns on investment in complexity. ...under a situation of declining marginal returns collapse may be the most appropriate response. What may be a catastrophe to administrators (and later observers) need not be to the bulk of the population... It may only be among those members of a society who have neither the opportunity nor the ability to produce primary food resources that the collapse of administrative hierarchies is a clear disaster. Among those less specialized, severing the ties that link local groups to a regional entity is often attractive. Collapse then is not intrinsically a catastrophe. It is a rational, economizing process that may well benefit much of the population. Tainter concludes by considering the implications for contemporary societies. And here I believe he finds himself in something of a state of denial. Or it may be that he felt a wholehearted endorsement of the idea that collapse lies in our future would have just been too much for his audiences to swallow. Tainter was well aware of the response experienced by The Limits to Growth. general economic breakdown, brought on by such things as unrepayable national and international debts, disruptions to fossil fuel availability, hyperinflation, and the like. He even acknowledges that industrialism will someday have to deal with resource depletion and its own wastes. The major question is how far off the day is. And he admits that patterns of declining marginal returns can be observed in at least some contemporary industrial societies in the following areas: agriculture; mineral and energy production; research and development; investment in health and education; government, military and industrial management; productivity of GNP for producing new growth; and some elements of improved technical design. 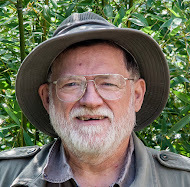 He identifies two opposing reactions to all this: economists who believe the challenges we faces are all solvable economic dilemmas (to be solved by economic growth), and environmentalists who believe that stimulating economic growth can only hasten the inevitable crash and hold that we should be aiming for economic undevelopment (what is known today as "degrowth"). He says that both sides are ignoring key historical factors. One problem with the principle of infinite substitutability is that it does not apply, in any simple fashion, to investments in organizational complexity. Sociopolitical organization, as we know, is a major arena of declining marginal returns, and one for which no substitute product can be developed. Economies of scale and advances in information-processing technology do help lower organizational costs, but ultimately these too are subject to diminishing returns. It is not that R&D cannot potentially solve the problems of industrialism. The difficulty is that to do so will require an increasing share of GNP. The principle of infinite substitutability depends on energy and technology. With diminishing returns to investment in scientific research, how can economic growth be sustained? The answer is that to sustain growth, resources will have to be allocated from other sectors of the economy into science and engineering. The result will likely be at least a temporary decline in the standard of living... The allocation of greater resources to science of course is nothing new, merely the continuation of a two century-old trend. Such investment, unfortunately, can never yield a permanent solution, merely a respite from diminishing returns. But then, in my opinion, he goes astray. He says that historical collapses were all of complex societies functional in isolation. Today's world is full of complex societies in competition with each other, which (he asserts) changes things. Any nation vulnerable to collapse will have to pursue one of three options: (1) absorption by a neighbour or some larger state; (2) economic support by a dominant power, or by an international funding agency; or (3) payment by the support population of whatever costs are needed to continue complexity, however detrimental the marginal return. A nation today can no longer unilaterally collapse, for if any national government disintegrates its population and territory will be absorbed by some other. Here is the reason why proposals for economic undevelopment, for living in balance on a small planet, will not work. Given the close link between economic and military power, unilateral economic deceleration would be equivalent to and as foolhardy as, unilateral disarmament. We simply do not have the option to return to a lower economic level, at least not a rational option. Competition among political peers drives increased complexity and resource consumption regardless of costs, human or ecological. I do not wish to suggest by this discussion that any major power would be quickly in danger of collapse were it not for this situation. Both the primary and secondary world powers have sufficient economic strength to finance diminishing returns well into the future. It is amusing (and sad) that this was written very shortly before the collapse of the Soviet Union, during which the rest of the world stood by and declined to finance the USSR any further. Evidently, there was insufficient economic strength to finance diminishing returns. Since then we have witnessed numerous cases where the world powers have stood by and allowed an assortment of small countries to undergo something very similar to collapse. Why? Because it didn't make economic sense to do anything else. Off the top of my head I would point to Cuba, Yugoslavia, Haiti, Somalia, Rwanda, Greece and Venezuela. The major powers are simply no longer ready to finance diminishing returns in those cases where there is no profit in it for them. The phenomena of "throwing them to the wolves", both in the case of small economically insignificant countries, and inconvenient groups and individuals within countries, is becoming standard procedure. Help from international funding agencies has turned out to be the kiss of death for developing countries. And people are very unwilling to support governments that call for austerity as a path to economic recovery (rightly so). Tainter goes on to say (as have so many others) that a new energy subsidy beyond fossil fuels will be necessary to finance declining marginal returns, and even that will only be a temporary fix. He believed that the lack of a power vacuum and the resulting competitive spiral have given us a temporary reprieve in which to search for that energy subsidy. ...in fact industrial societies are subject to the same principles that caused earlier societies to collapse. If civilization collapses again, it will be from failure to take advantage of the current reprieve, a reprieve paradoxically both detrimental and essential to our anticipated future. Sorry, Mr. Tainter—in the event, that's not the way it turned out. Whatever reprieve there was in the closing days of the twentieth century has slipped between our fingers. In the twenty-first century, those who collapse are largely abandoned by those striving to avoid a similar fate. This just goes to show you how difficult making predictions is, especially about the future. But none of that takes away in the least from the main message of this book, which I would say is rock solid—human societies use complexity to solve problems and because of declining marginal returns, those solutions are always temporary and often lead to collapse. This principle should be kept very much in mind by those of us who are trying understand the events unfolding around us in the world today. I recommend reading the book, but there are also a quite a few videos featuring Joseph Tainter on YouTube. I enjoyed reading your post and will read your other. I've been mulling over Tainter's ideas for years now. He's the best I read in terms of understanding "sustainability," a term that was not yet in the popular vernacular when he wrote Collapse of Complex Societies in 1988. I'm sure you've come across this, but Tainter is very specific about his definition of collapse, and he doesn't consider the collapse of the USSR to fit his definition. There are many things to like about the book, but the one I really love, is that it was written at time when the notion of collapse, global warming, peak oil etc. were getting very little or no air time. Write more if you get a chance! I was going to read 'Collapse' again but there is sooo much to read nowadays! Thanks for your informative post and comments. I will at least check out the videos you've linked to....I don't think I've ever seen Tainter speak. It looks like some sort of collapse will always be an end point for human societies, although it may take various forms and occur for various reasons. The one that's on the horizon may well turn out to be the collapse that ends all collapses! Nice to hear from you, Mark. I actually hadn't heard Tainter's thoughts on the "collapse" of the USSR, but it doesn't surprise me that he doesn't think it fits his definition. My ideas on the fall of the USSR come mainly from Dmitry Orlov, who definitely does classify what happened to the USSR as a collapse. Orlov would remind us that there are five stages of collapse (financial, commercial, political, social and cultural) and that the collapse elevator doesn't have fall all the way to the basement in order for events to be called a collapse. I think we are going to see a lot of partial collapses in the years to come, until they finally add up to a full scale collapse several decades down the road. Interesting to watch if you can manage not to get anything nasty splashed on you. Us Canadians are watching events in the USA with exactly that thought in mind these days. Understanding sustainability in terms of avoiding diminishing returns on productivity is an intriguing idea that I shall have to give some thought to. Hi Bev, glad you're still following and enjoying my blog. Let me know if you enjoy those videos by Tainter. Orlov's writings are great too! The one thing that help me distinguish the two uses of "collapse" is I tend to thing of Tainter's with a capital "C" and Orlov's with a lowercase "c". While the USSR did collapse, it was merely a political and financial one, big and scary things, but they are not the Collapse that Tainter writes about in ancient civilizations and the current trajectory we are on. Tainter's definition is more extreme, loss of arts, demise of cities (exemplars of complexity), language, and a dramatic reduction in all shapes of complexity, big population die offs etc. Rome had shed many of its territories, changed religions, financial collapses, assassinations and was still called "rome". To me, the USSR was shedding land that it could no longer afford, in the same way Rome would lose territory, and gain, and lose etc. Russia was always the homeland, and the blocs were merely lands that it tried to hold onto and couldn't. Is Russia("u.s.s.r.) trying to regain lost territory? Orlov is a favourite of mine, especially for his deadpan, dry sense of humour. As good in person as he is on paper. I certainly didn't mean to make a big issue of some supposed disagreement between Tainter and Orlov about whether the fall of the Soviet Union was a real collapse of not. To the best of my knowledge they have never gotten together to argue this out, or even communicated over the internet about it. I did a quick Google search and yes, in at least one place, Tainter says the fall of the Soviet Union was not a collapse in the academic sense of the word as he uses it. In another place he says, "The Roman Empire could not afford such a large army and, eventually, it destroyed itself in the attempt of maintaining it. Not unlike the modern Soviet Union." So I am not sure what he really thinks. But I think of it this way. Tainter is an archeologist and is looking at longer time spans, decades, or in the case of the Roman Empire, centuries. Orlov is working in the trenches and looking at changes over much shorter time spans. His 5 stages of collapse might not individually count as collapse to Tainter. But over time they add up and eventually you have a collapse. The thing to remember about the USSR is that its collapse is not yet finished. Russia may appear strong under Putin, but this is temporary. At the Age of Limits conference in 2014 I saw Orlov and John Michael Greer on the same stage discussing this. Dmitry was very keen of Putin as just the sort of leader Russia needs to bring it back to greatness. Greer classified him as a warlord, just the kind of leader you expect to find temporarily enforcing order at one stage during the collapse of an empire. Certainly, there is no clear mechanism of succession in place and when Putin goes (naturally or otherwise) it will be chaos (collapse?) until another strong man steps up. Really good point about Putin--I wish I could have been at that conference. Orlov has opened my eyes to some great insights. He's privileged in having lived in the last days of the USSR and America. You're right, it does seems like Putin has been a galvanizing force in Russia--they sorta tried out democracy for awhile, and now they are back to a soft autocrat. There are so many parallels between us and Russia, it's uncanny... Greer is great too, very well read. I think this century is going to be a rough one politically in many countries. The issue of succession is going to be particularly thorny. Even democracies are having trouble. But it is an much more serious thing for countries currently ruled by strong and relatively benevolent dictators. Finding replacements for these fellows when they die is going to be difficult. Are you aware of complexity issues being addressed in socio-ecological research that deals with the sustainable use of biodiversity resources? As an ecologist I see a lot of effort going toward recognizing and quantifying ecosystem services for sustainable use (e.g. through IPBES), but so far I did not find mentions of J. Tainter's elegantly argued theory in this context. I haven't happen upon any of the work being done in that area. Could you recommend any websites or books that would help bring me up to date? Not really, but this may mean that I am just not familiar enough with this field. I keep looking.